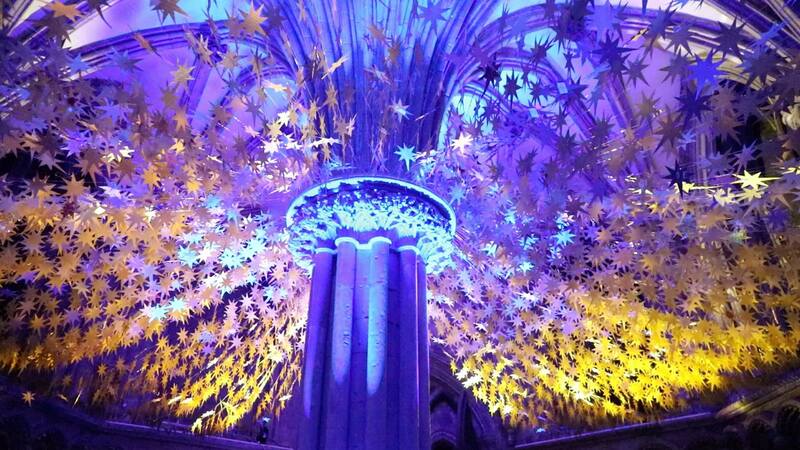 During this year’s events at Lichfield Cathedral leading up to Christmas in the period of Advent, The Artist Peter Walker created an installation artwork entitled’ Starry, Starry Night’. The installation, a bespoke work created specifically for Lichfield Cathedral, was a large scale project that incorporated working with different schools and members of the public within the Lichfield Diocese as part of its production. The artwork created saw a transformation of the space adopted for use within the Cathedral using light and sound projection. 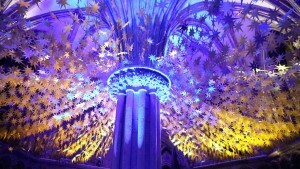 The installation was created from 6,200 hanging gold and silver mosaic paper stars, each star had been decorated by a schoolchild or member of the public and had an individual message written on it – either in form of a prayer, Christmas message, or wish, the activity of making the stars was part of children’s school lessons in art, or religious education. The installation was set to music by composer David Harper written specifically for the artwork entitled ‘Constellation’. 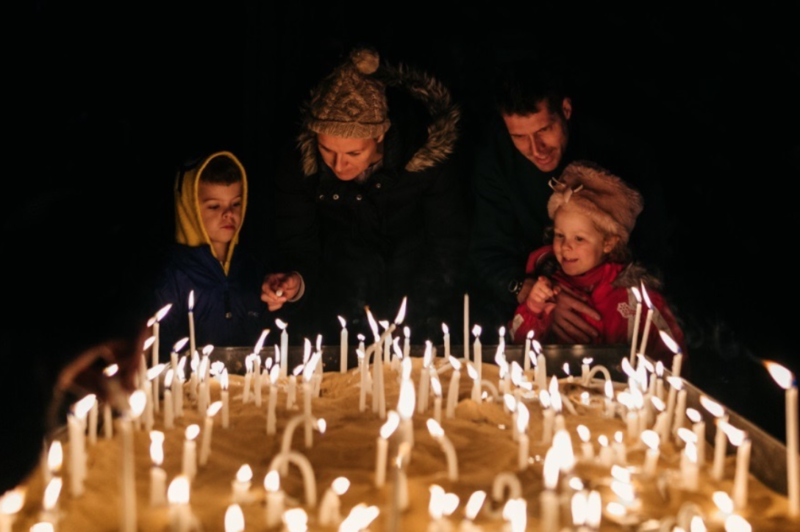 The Stars were then lit with projected light depicting the night sky and star constellations. 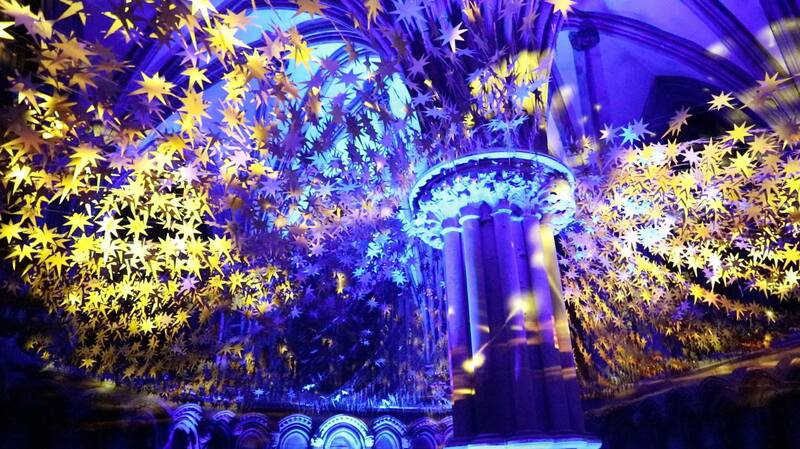 The installation artwork was put together by the Artist gathering and hanging the 6,200 individual stars within the Chapter House and Pedalavium areas within the Cathedral with help from volunteers. The Installation was open to public display from 1st December to 6th Jan. It was also on show during the Cathedral Illuminations that occurred for six nights before Christmas. ‘I enjoyed all of the stars in the room’.